Can I Claim Expenses on Income Tax Without Receipts? While it's true that you don't send your expense receipts into the Canada Revenue Agency (CRA) when you file your income tax online, as many of us do nowadays, you're still expected to have those receipts and be able to produce them when asked. Note that you have to have actual receipts for your business expenses before you can claim them. Many business people make the mistake of thinking that a bank or credit card statement is enough proof of an expense. It's not. All a bank or credit card statement proves is that a payment was made. What's, Are Your Chances of Being Audited? These businesses have a higher likelihood of being audited as the CRA considers them to be the most likely to be participating in the underground economy by taking cash payments from customers and not reporting the income. And each year the CRA chooses certain types of businesses to investigate more closely, upping the possibility of being audited for those businesses. Learn more: Read 10 Red Flags That Will Get Your Canadian Small Business Audited. 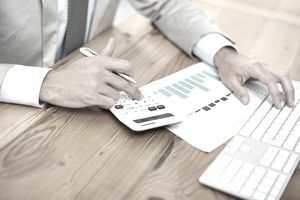 In other words, your chance of being audited may be quite a bit higher than you think, and if your business is selected to be audited, you will certainly want to have all your records in order. Lost receipts mean lost opportunities to lower your income tax bill. Not having receipts to back up your claimed business expenses will mean that those expenses will be disallowed and you will end up possibly having a hefty tax bill to pay that you didn't expect. It will also make the audit process more difficult and protracted, and if there's one person you don't ever want to annoy, it's the person doing your audit! The possibility of being audited aside, keeping complete and accurate business records is a requirement for running a successful small business. If you qualify as a northern resident or have moved to take a job, study at a post-secondary institution, or run a business at a new location the CRA allows for a "simplified" method that does not require receipts for meal and vehicle expenses. Meal Expenses: If you decide to use the simplified method, you can expense a flat rate for meals of $17 per meal up to a maximum of $51 per day without receipts for the 2017 tax year. Note that while you do not have to keep meal receipts when using the simplified method, you will have to keep records of the trips you are claiming meal expenses for (vehicle log books, air, train, bus, taxi receipts, etc.) If your meal expenses are higher than the simplified daily limits, you can use the detailed method to claim the actual amounts, in which case you must have receipts to back up your claim. Vehicle Expenses: The simplified method for vehicle expenses allows you to claim a per kilometer rate rather than keeping track of individual expenses such as fuel, repairs, and insurance. See Meal and Vehicle rates for travel expenses for the kilometer rates for each province or territory.